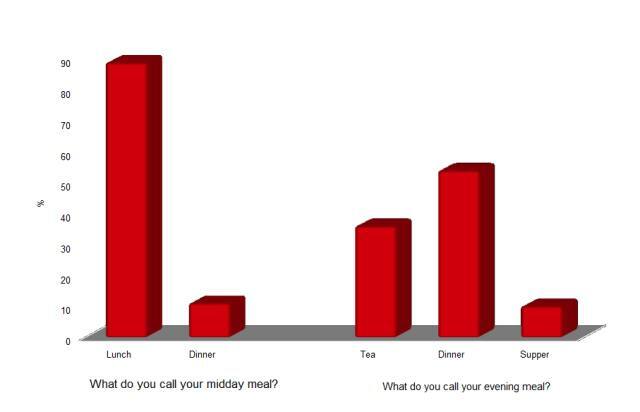 Remember the other week I ran a survey about what people call their main mealtimes? The results are in, and as you can see above, they’re quite surprising. In all honesty, I wasn’t expecting such a decisive result over the mid-day meal. Lunch it is, and that appears to be that! Results for an evening meal name were a bit more evenly spread, with a strong third of people calling it ‘tea’, just over half using ‘dinner’ and the rest, a marginal 10% calling it ‘supper’. As I originally thought, it doesn’t seem to matter what you call your evening meal, you’re likely to be understood. One commenter set out his views on the matter and caveated the whole thing with the disclaimer that “this information is only valid within 15 miles of my house at the top of North Yorkshire”. Funny, and striking right at the heart of the regionality of mealtime naming conventions. 88% of participants (95 in total) were from the UK, 9% from the US and the rest from Canada, Oz and New Zealand. Many thanks to the single person from somewhere in Indonesia who took the time to fill out their answers. Thanks to everybody who took part. Read this with interest although i think the reason the evening meal vote was split is because it is possible to have all 3 and therefore use all three names. Tea with the kids, dinner with husband, supper b4 bed! Would you risk jail for a bad restaurant review?